A protester at the pro-Students for Fair Admissions rally held in Copley Square Sunday. 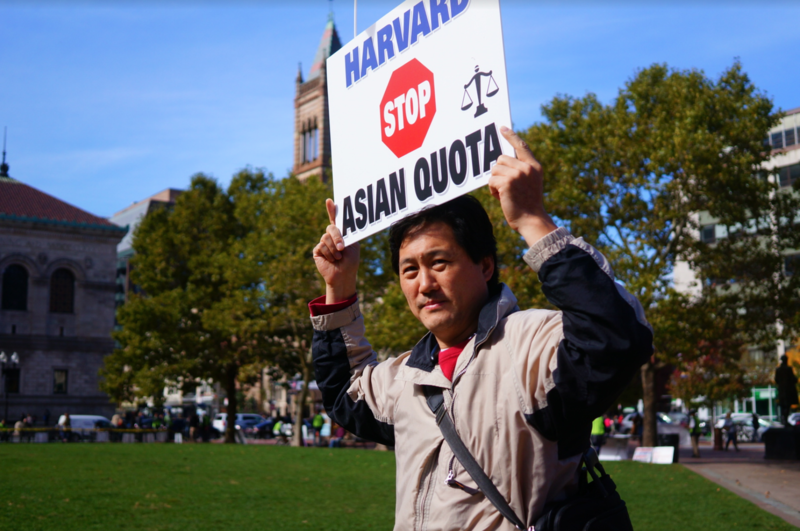 SFFA is suing Harvard over allegations it discriminates Asian-American applicants. The day before a lawsuit challenging Harvard's admissions practices heads to a high-stakes and high-profile trial in a Boston courtroom, hundreds of demonstrators took to the streets in Cambridge and Boston Sunday to hold two dueling rallies — one pro-Harvard and one pro-Students for Fair Admissions, the group suing the University. 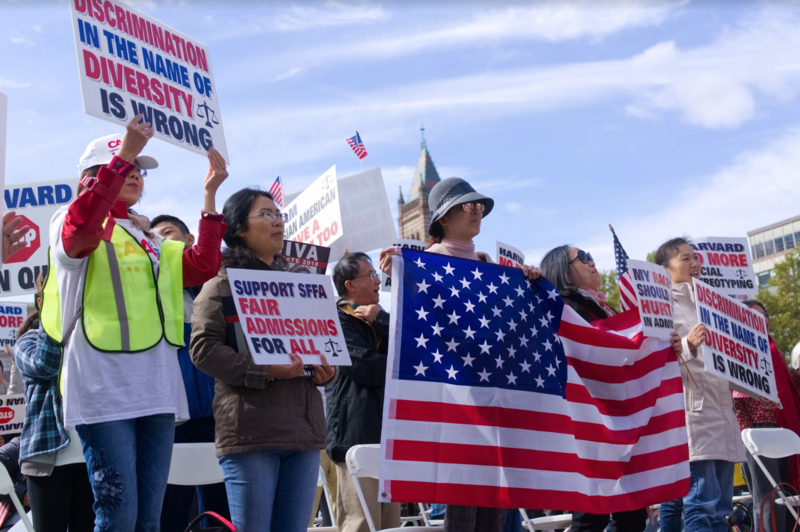 SFFA filed suit against Harvard in 2014, charging that the College's race-conscious admissions policy has led the school to discriminate against Asian-American applicants. Harvard has repeatedly and strongly denied all allegations of discrimination — and a number of students, alumni, and other universities have lined up behind the University. SFFA, by contrast, has earned the support of the federal government; the Department of Justice has twice intervened in the suit in SFFA's favor. Pro-Harvard demonstrators gathered in Harvard Square Sunday, while SFFA's backers convened in Copley Square. Follow along with live updates from Crimson reporters spread around the city below. Students for Fair Admissions President Edward Blum poses for a picture with a protester during a pro-SFFA rally held in Copley Square Sunday. At 2:47 p.m., the man of the moment appeared. Students for Fair Admissions president and conservative litigant Edward Blum stepped behind the microphone in Copley Square, drawing applause and cheers of “Thank you, Edward!” from the crowd. The lawsuit against Harvard marks the latest effort in Blum’s decades-long career of anti-affirmative action advocacy. Since 2008, Blum has sponsored a series of cases that sought to change the way American colleges and universities admit students. Blum pointed to Harvard’s history of racial discrimination in its admissions process, noting that the school set a cap on the number of Jewish matriculants in the early twentieth century. 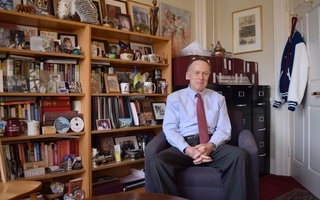 SFFA had previously asked that evidence related to the University's past anti-Semitism be permitted in court; Harvard, however, argued the 1920s-era policies are not relevant to the College's admissions system today. In pre-trial proceedings held in early October, Judge Allison D. Burroughs ruled evidence related to the episode will be allowed in court in a “very limited” capacity. Blum concluded by saying he will keep fighting no matter how Burroughs ultimately rules. Protesters line up and hoist signs at the pro-Students for Fair Admissions rally in Copley Square Sunday. Zoey Lee, a ninth grader from Boston University High School, was among the first to speak at the pro-SFFA rally in Copley Square Sunday. She said she hopes to benefit from “equal opportunities” when she applies to college and that she objects to Harvard’s race-conscious admissions policies. “There are many young Asians who are gritty and determined. There are many young Asian Americans who have a great personality,” she said. Another speaker, Kelley A. Babphavong '20, canvassed possible alternatives to race-based admissions. She suggested Harvard could weighs applicants' socieoconomic status in a race-blind manner instead. “It is not mutually exclusive to advocate for diversity while also openly criticizing Harvard for discriminating against a specific racial group,” she said. “Being Asian at Harvard is not easy, and I hope that the eradication of Harvard’s current admissions policies will allow Asians to no longer be discriminated against." “Harvard ought to recognize that skin color is not a substitute for life story,” he said. As the crowd began to thin, college admissions consultant Vijay Chokal-Ingam — the brother of actress Mindy Kaling — approached the microphone. He spoke about how he “scammed” admissions officers by pretending to be a black student while applying to medical school. As the pro-SFFA rally stretched into its third hour, Middletown, Conn. zoning and planning board member Tyrell Brown mounted the stage to lecture the audience about the importance of the Harvard admissions trial. Brown noted he is the youngest black Republican ever elected to office in Connecticut. “We must take note that instances like this are happening each and every day at universities across this great nation," he said. Donning a Harvard athletics sweatshirt, Harvard College and Medical School graduate Samuel T. Wong '84 said he traveled to Copley Square Sunday because he thinks the College's admissions process is far too opaque. “I think it raises a lot of noise — it’s good noise and I’m not into banners or oversimplifications but I believe it is a good noise and a necessary noise because I know too many people who are really the best citizens of America who were rejected by Harvard and I don’t even know them, but I felt their pain,” Wong said. About 30 minutes into a pro-Students for Fair Admissions rally Sunday, things got political. 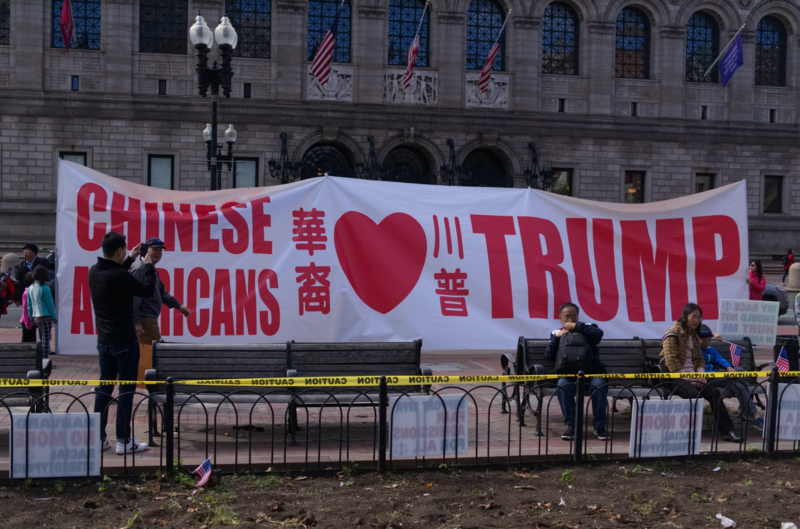 Swan Lee, a board member of the Asian American Coalition for Education, severely criticized Harvard and its race-conscious admissions policies in opening remarks she gave at the Copley Square rally — earning claps and cheers from the audience. Kathy Zhu, a student at the University of Central Florida, stood proudly in front of the “Meritocracy” sign Sunday afternoon. Asked whether she believes this case will go to the Supreme Court, she did not hesitate. Pro-Harvard protesters wield signs in support of the College's race-conscious admissions policies at a rally Sunday. President of the Boston Teachers Union Jessica Tang ’04 stood to address a crowd of pro-Harvard demonstrators early Sunday afternoonon, speaking for several minutes about what she sees as the value of diversity in education. She also offered scathing criticism of SFFA President Edward Blum. “Our movement, your movement, this movement is about protecting opportunity from kindergarten to college,” Tang said. She then accused Blum of exploiting Asian Americans in his quest to overturn race-conscious admissions policies at American institutions of higher education. A man demonstrates against Harvard and its race-conscious admissions policies at a rally held in Boston Sunday afternoon to support advocacy group Students for Fair Admissions. 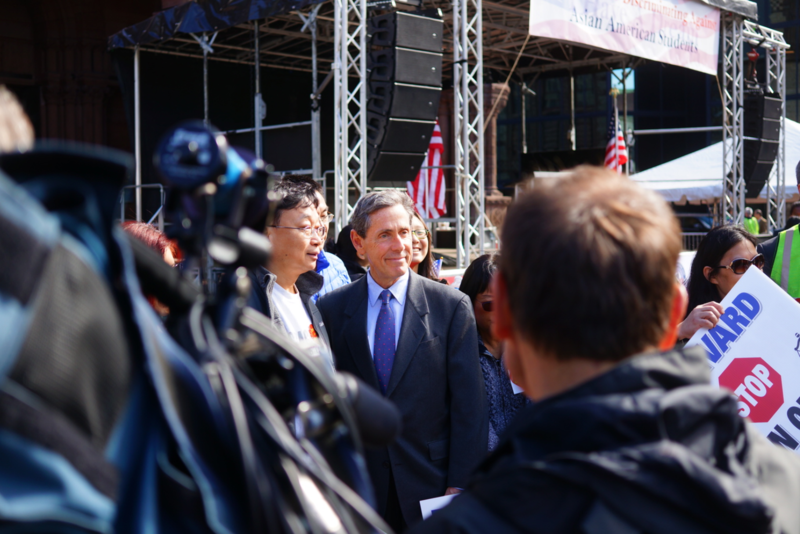 SFFA sued Harvard in 2014, alleging the school discriminates against Asian-American applicants. Over 250 people are now massed in Copley Square to protest Harvard's race-conscious admissions policies. Demonstrators have stuck anti-Harvard posters — including one “Race is not for bargain" — on fences around the square. Ally Wang, the wife of a Harvard Medical School professor, said she traveled from New Haven, CT to attend Sunday's rally. Wang said she has two sons: one five-year-old and one 10-year-old. But she says could care less whether her children get into Harvard or not. “I don’t really care if my children go to Harvard or not — we probably even kind of have legacy because my husband works for Harvard —but the way Harvard is doing it really hurts,” Wang said. 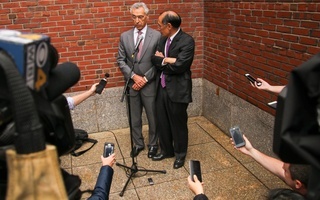 Wang said she is rallying to protest Harvard's admissions policies because she dislikes the way the College evaluates Asian students' success during the interview process. Documents released over the summer as part of the lawsuit showed that Harvard admissions officers tend to give Asian-American applicants lower scores for "personal traits" like grit and humor than they do applicants of other races. 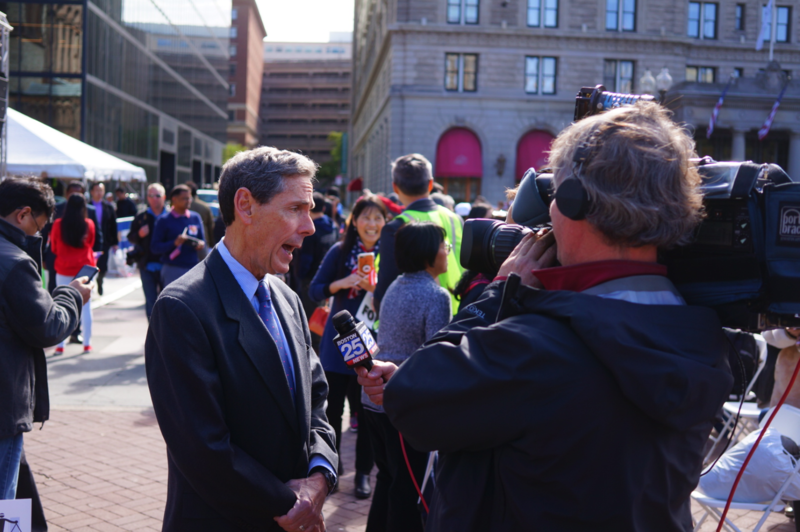 Edward Blum, the president of Student for Fair Admissions, gives an interview to a reporter during a rally held to support his group and its lawsuit alleging Harvard discriminates against Asian-American applicants. 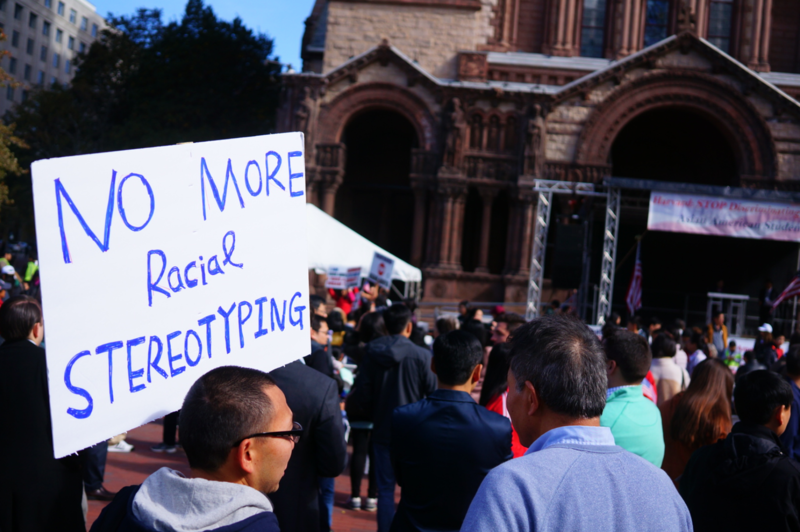 Hoisting signs reading “Harvard Stop Asian Quota” and “Harvard No More Racial Stereotyping,” protestors have gathered in Copley Square to rally in support of Students for Fair Admissions. 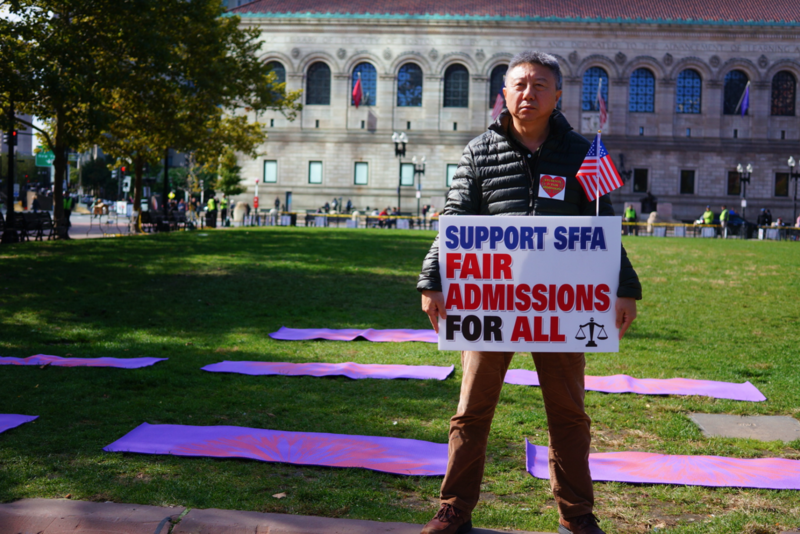 Alex Xia, who wielded a sign reading “Support SFFA Fair Admissions for All,” said he's spent time researching college admissions — and that the results of that research drove him to demonstrate Sunday. 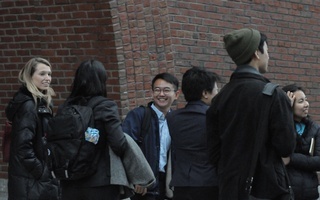 Sunny Zhao, who stood alongside Xia, said he thinks the admissions processes at Harvard is very unfair to students of Asian descent. 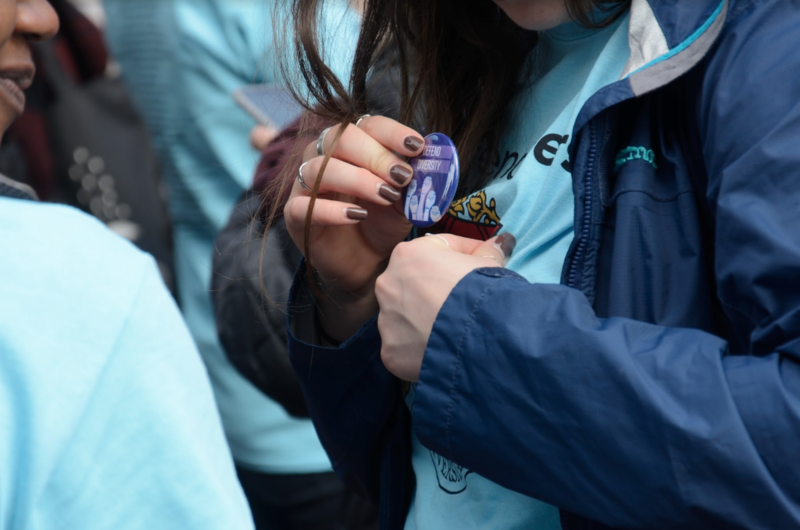 A protester pins a button to her shirt at a pro-Harvard and pro-affirmative action rally held Sunday afternoon in the Square. 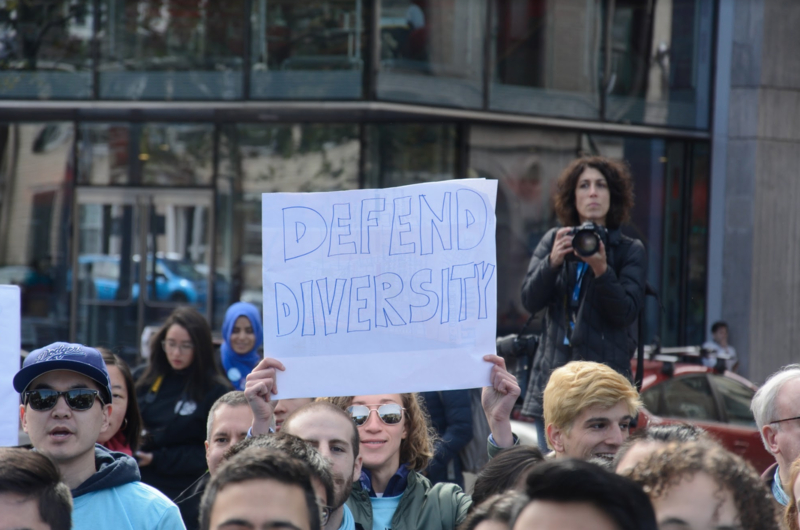 Addressing a near-silent crowd, Harvard doctoral student Gregory Davis and the Harvard Temporary Protected Status Coalition's Doris Reina-Landaverde stepped behind the microphone to defend diversity and affirmative action. "This is what we're meant to be here for," Davis said. "This is how we make Harvard better, and this is what's right." Reina-Landaverde also spoke about issues including immigrant rights and unionization. At times she grew visibly emotional and almost unable to speak through tears, which she acknowledged to roars of approval from the crowd. "I'm so sorry," she said. "It's hard for me — talking about how we suffer here in Harvard, and how when we put in complaints to Harvard, Harvard bosses say 'You don't tell me what I have to say. I'm the boss and I do what I want.'" Demonstrators mill around during a pro-Students for Fair Admissions rally held in Copley Square Sunday. 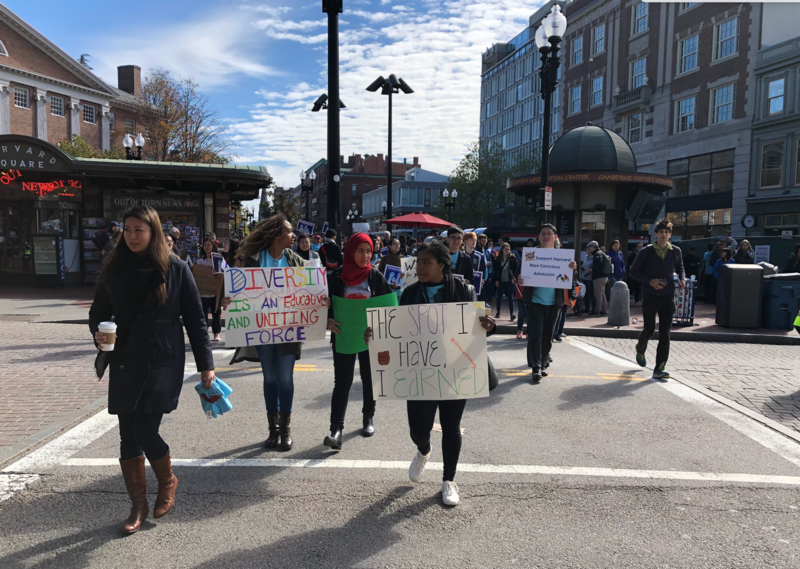 Students march from Harvard Square to Cambridge Common to show their support for the College's race-conscious admissions policies. A large crowd of pro-Harvard demonstrators walked down Mass. Ave. from Harvard Square to Cambridge Common wielding massive banners and leading chants early Sunday afternoon. Cambridge Police Department officers stopped traffic for several minutes as the group crossed the street. 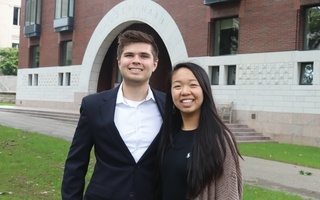 Co-founders of the Coalition for a Diverse Harvard Jeannie Park ’83 and Michael Williams ’81 said their group sponsored the rally in Harvard Square to raise awareness and to drum up support for Harvard’s race-conscious admissions policies. “We want to make sure that people, including students and alums of Harvard are focused on this issue, and come out and stand in support of the position to support diversity, and support equity, and support higher education in general,” Williams said. Harvard graduate Lushi Li '10 was visiting her parents in Boston when she found out about the #DefendDiversity rally in Harvard Square. Li said she immediately knew she had to attend. "[Harvard] can be a great opportunity for a lot of students, and I think having a diverse student body is really important for the student experience itself for the opportunity it offers to underrepresented and underprivileged students," Li said. "It is important to be here today." Another graduate — Carolyn W. Chou ’13, who spoke at a pro-affirmative action panel discussion held on campus last week — said she also showed up to prove her support for the College's race-conscious admissions policies. — Staff writers Shera S. Avi-Yonah, Alexandra A. Chaidez, Delano R. Franklin, Iris M. Lewis, Molly C. McCafferty, Aidan F. Ryan, and Samuel W. Zwickel contributed reporting.